From bark to bio-oil Forest companies could be harvesting the source of their own energy when they carry out logging operations, through the use of a bio-refinery a Canadian company has developed that converts forest slash to bio-oil. The dramatic rise in fossil fuel prices is one reason alternative energy processes like pyrolysis are back in vogue. Pyrolysis is a conversion process used to produce bio-oil from biomass. A small Canadian start-up company called Advanced BioRefinery Inc. (ABRI) has developed a mobile pyrolysis unit to convert forest slash such as branches, stumps, tops and leaves to bio-oil, with financial assistance provided by the government of the province of Ontario. The bio-oil ABRI produces will eventually be used as a heating oil replacement by a forest company. In addition to use in industrial boilers, bio-oil can also be used in diesel generators and in turbines to produce electricity. ABRI owner Peter Fransham says that pyrolysis is not an energy production process, but an energy conversion process. It is a liquefying technology that takes the same energy that already exists in the solid wood fibre and converts it into a more manageable form. Converting the slash to a liquid makes the energy roughly seven times more economical and easier to transport. Biomass, it should be noted, is also a renewable resource. "We've really only been competitive since the year 2000, when the price of oil finally went above the conversion costs for a lot of biomass systems," says Fransham. "Coupled with that, you have increased public interest in renewable energy now, largely brought about by climate change. Economics plus the Kyoto Accord on climate change have finally made it a viable technology." Pyrolysis is essentially the process of converting a solid biomass such as wood fiber or peat moss into a liquid by using high heat in a carefully controlled, oxygen deprived environment where the internal temperature in the reactor can reach 1,000 degrees Fahrenheit. The process itself is extremely quick, partially to prevent secondary chemical reactions. It takes biomass entering the ABRI pyrolysis system about one minute to separate into solid, liquid, and gas streams. The biomass produces about 60 percent bio-oil, and 40 percent charcoal and synthetic gas. The charcoal and synthetic gas are used to dry the biomass prior to conversion and to produce the heat needed for the conversion process, leaving behind only ash as a byproduct. The prototype mobile bio-refinery built by Advanced BioRefinery Inc. (being set up) can process 50 tonnes of forest biomass per day, which coverts to about 30 tonnes of bio-fuel. ABRI has been contracted by the Ontario government to develop a modularized and mobile pyrolysis unit that it hopes to have operating in a sawmill yard belonging to Gogama Forest Products in north central Ontario, converting bark to bio-oil, by this fall. Even though ABRI is considered a start-up company, Fransham has been working to refine his pyrolysis process for biomass for quite some time. In 1988, he formed Encon Enterprises to convert Newfoundland peat moss into liquid fuel. Between 1988 to 1995, Encon designed and experimented with a fluid bed fast pyrolysis system, and had a license from the University of Waterloo to use its fast pyrolysis process. 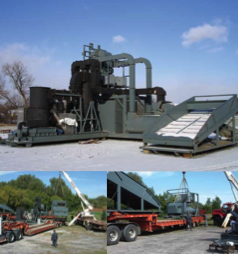 Realizing its limitations, Fransham decided to depart from standard pyrolysis methods in 1994, investigating the feasibility of a heated auger reactor to deal with specific challenges related to removing resins from southern yellow pine biomass that was clogging up equipment. He also achieved a breakthrough in 2000, discovering that it was possible to successfully conduct fast pyrolysis on biomass at a lower temperature. Following a move to Ontario, he mothballed Encon Enterprises Inc. and formed Advanced BioRefinery Inc., to further the commercialization of the technology. Fransham gives a frank description of the current stage of pyrolysis development. "It is still at the stage of development and demonstration as a fuel," he says. "On the fuel market, it's still very much a developing technology." Although he has been actively involved in pyrolysis research and development since the 1980s, the Ontario project has taken his work to a new level because of the mobility factor and size of the processing plant. The prototype bio-refinery built by ABRI can process 50 tonnes of forest biomass per day, which converts to about 30 tonnes of bio-fuel. "This is the first time we've built one this big," says Fransham. "You pretty much have to write the manual as you go. We have it under computer control, and you'd think with the number of smaller plants that we've built that we'd be able to turn this one on and it would work. However, it's not that easy. We end up learning an awful lot each time we scale up." What encouraged the Ontario government to move its interest in this technology to the front burner was the volume of forest slash that is traditionally piled at roadside and burned, particularly near northern communities where electricity costs are high and expensive fossil fuels are being used to power electrical turbines to provide the communities with power. A ballpark estimate suggests that about 15 percent of the wood fiber left from forestry operations is slash, although a project is currently underway to help determine how much unused forest biomass exists in Ontario and where it is located. The proving ground for the commercial application of this technology will be when it serves as a replacement fuel for communities--and industry--located in remote areas, that also happen to be near significant forest harvesting operations. "It really makes sense in remote, off power grid areas or where industries are energy consumptive and would like to switch from fossil fuels," says Fransham. The obvious target is the forest industry itself, which often builds sawmills, pulp mills and panelboard plants in remote areas that are extremely close to the wood fiber resource. "We can be very cost competitive," Fransham adds, "but only if there is a market for our fuel within a 400 to 500 kilometre shipping distance of where the biomass is located. You still run into the problem of trucking the bio-oil out of the bush." So, just how cost competitive is bio-oil and how does its energy output compare to conventional fossil fuels? The straight conversion cost taking into consideration such issues as labor, equipment, amortization of capital, and standard fixed and operating expenses, but without taking the cost of the feedstock into consideration, is about $2 per gigajoule. In terms of feedstock costs, ABRI says every $10 per dry tonne of material adds about $1 per gigajoule. It estimates its feedstock costs at $20 per dry tonne, meaning that the company's break-even cost for producing a gigajoule of energy is between $4 and $5. This is as compared to the $8 to $10 per gigajoule cost of natural gas or $15 to $20 per gigajoule of #2 fuel oil. The heating value of the bio-oil is roughly half of #2 heating oil, or about the same as the solid wood fiber prior to conversion, meaning that twice as much bio-oil will need to be burned to deliver an equivalent amount of energy. In terms of its handling and combustion, bio-oil has its challenges, although continuing research is really paying off. Experience has shown that bio-oil can not be reheated as it has a tendency to polymerize into a plastic. It also has a tendency to become viscous over time, so its short shelf life has to be considered by both producers and consumers. Among the best potential locations for the company's bio-refineries are remote forestry-based based communities-where wood material for fuel is readily available-and where expensive fossil fuels are currently being used to produce electrical power. If the moisture content is too high or too low, it has a tendency to want to separate into two phases--an aqueous phase on top and a very heavy, tar-substance at the bottom. However, research has shown that it can be stabilized with ethanol, methanol, or glycerol, which is a byproduct of manufacturing biodiesel. So in future, it might be prudent to locate a bio-oil plant near a bio-diesel manufacturing facility. "What I would like to ultimately see is that you set up clusters of technologies so that each feeds off the other," says Fransham. "There is no one bio-energy technology that is the end-all and be-all. We all have our niches and we can cooperate and really build on one another. We will get much further doing that than trying to go head to head." A final issue that Finland seemed to have solved is to develop the right air-to-fuel ratio when burning bio-oil in a furnace, and making the necessary equipment modifications taking into account that the furnace will be burning double the volume of bio-oil, as compared to #2 fuel oil. The Canadian Centre for Mining and Energy (CANMET) has also developed burners that are capable of combusting bio-oil. "These are all things that you can design around easily," says Fransham. In terms of his own pyrolysis plant, it consists of six, 20-foot-long modules that can be easily transported and assembled within a week. 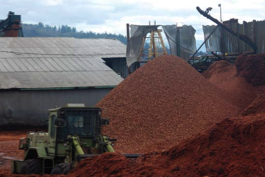 The biomass amassed in brush piles will undergo first stage grinding at roadside, then will be loaded into dumpster trucks that will deliver the biomass to the plant location. The material is stored in bins at the plant site and fed into the pyrolysis plant as needed. The first stage of the process is drying the biomass, and this alone has proven to be an economic boon for ABRI. Fransham says that ABRI has orders for a number of its dryers to companies using biomass for a variety of purposes, such as in the wood pellet manufacturing industry. The manufactured bio-oil will be collected by tanker trucks able to ship 50,000 liters of bio-oil per truckload. 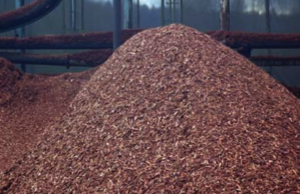 Fransham estimates that there are realistically about 100 industrial or commercial plants in Ontario alone that could convert to using bio-oil generated from forest wood waste. For now, the company is focused on marketing its pyrolysis plants to companies and communities where a strong business case can be made to switch to bio-oil. One area that he forecasts has real potential for this technology is in the Western Canadian province of British Columbia, where the forest industry has ramped up significantly to harvest pine trees before they are destroyed by the mountain pine beetle. Literally, tens of thousands of tons of slash are being left in the woods in the effort to salvage the hundreds of thousands of acres affected by the beetle.